Here’s why: after returning home, in an e-mail exchange with NBA Betting Oddsthe Bum, I sent him the recipe. With all sponsor constraints behind us, the recipe could be altered into a final state, which would be the defining recipe for this drink. Jeff went Rainman with the drink, effortlessly dissecting its flavor and recommending useful tweakages. 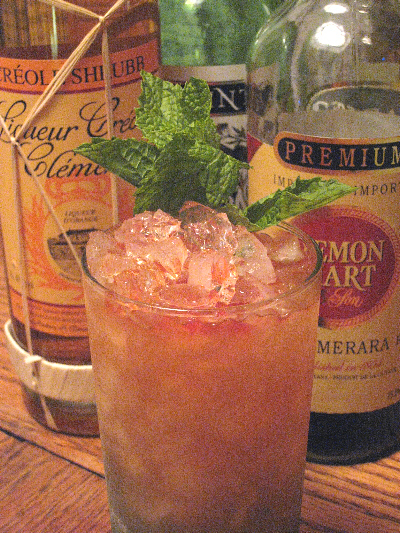 This is the resulting drink; with the changes made in the past month, and with the difficulty of getting anyone to remember a name as clunky as Pepe Llulla Swizzle, I felt it necessary to change the name as well, while keeping the spirit of Hearn’s subject. is it really as deep orange as it looks in the photo? that’s gawjus! ?? That sounded so good, and Seattle was having such nice weather, that I made a couple last night! I actually made a slightly-imperfect versions of your drink; I only have the Lemon Hart 151o (as you know, strangely much easier to find in Washington than the 80o). So I did 1/2 oz of that and 1/2 oz of Myers, in order to keep some of the richness of the Demerara without getting totally smashed (in retrospect, Rhum St. James may have been a better choice than the Myers to make up the difference). I did have a nice Cruzan Single-Barrel for the light rum, though. Paul, unfortunately BevMo doesn’t carry Creole Shrubb, but this post inspired me to head down to Wiemax on the peninsula and pick up bottles of that & Lemon Hart 80o (already had the 151o, both also not stocked at BevMo).